Dr. Pete Williams has been a part of Northeast Georgia Medical Center since 2010. Not only is Dr. Williams a hospitalist with Northeast Georgia Physicians Group (NGPG), but he also participates in multiple quality and safety committees and medical staff administration at NGPG. 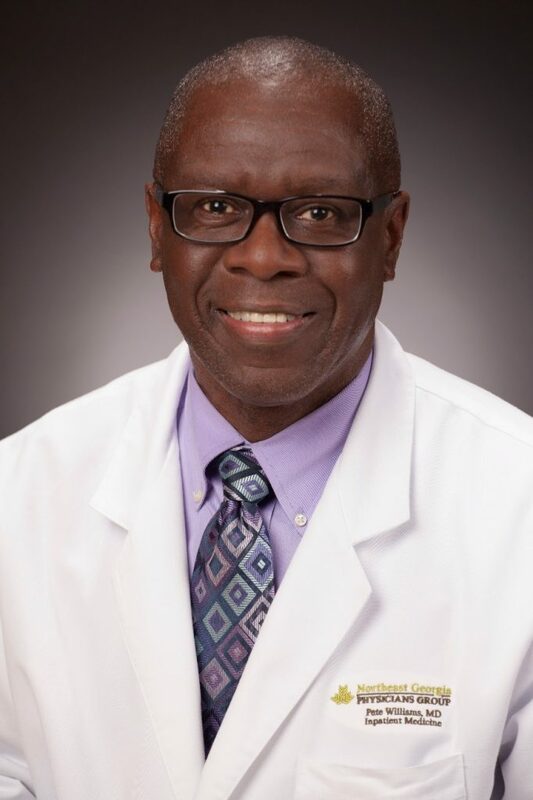 Dr. Williams attended SUNY Health Science Center in Brooklyn, NY before completing his residency in Internal Medicine at Montefiore Medical Center at Albert Einstein College of Medicine in Bronx, NY in 2000. He has vast experience working with medical students and residents and served as the Clinical Assistant Professor of Medicine at the Albert Einstein College of Medicine from 2000 through 2007. Dr. Williams’ experience and passion for teaching makes him a great fit for NGMC’s Internal Medicine Residency core faculty. Dr. Williams worked on clinical research that dealt with AIDS and HIV infection from 1999-2007. With his vast experience in clinical work, research, administration, and teaching, Dr. Williams is a phenomenal addition to our core faculty who empowers the physician leaders of tomorrow beginning with our internal medicine residents.